Sometimes You Just Have to Sit Back, Let Things Happen and Live a Powerful Life! Sometimes we try so hard, over and over, to make things work, when in reality, what we’re working towards isn’t supposed to happen for us. This may be a marriage or a career path. 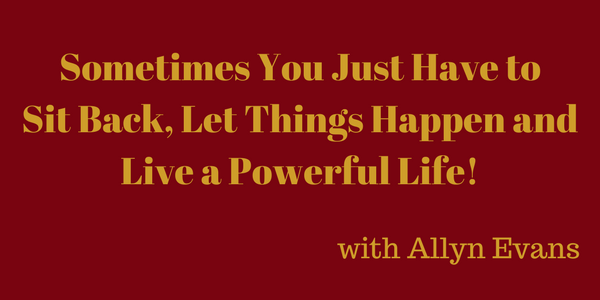 My guest today, Allyn Evans, is a divorcee that learned that sometimes you have to sit back and just let things happen. She shares with us that through her work with Monroe Institute and the Hemi-Sync Technology, she has been able to accomplish the life that she loves and continues to have exciting new opportunities presented to her that she never expected. She explains how simply raising your energy vibrations can open up so many different possibilities that you may have never even dreamed of. She’ll also be offering a FREE PDF of her book, Live a Powerful Life, so you don’t want to miss out!